Understanding what it means to be Catholic is a major component of the St. Laurence experience. Students are given opportunities to act on their faith by reaching out to fellow students, neighbors and people in need. Blessed Edmund Rice was given the grace to respond to the call of Jesus by identifying with Christ in the poor. His example evoked a deep awareness of God’s loving presence in all with whom he came in contact. He also awakened within them a consciousness of their dignity as children of God. He invited the followers to share the Gospel insight to reach out to the needy, especially the materially poor. His mission has spread globally, spanning over five continents and influencing young people in over 250 schools worldwide. St. Laurence models the examples set by Blessed Edmund and the Christian Brothers to develop its students spiritually through these Essential Elements. Click here to learn more about the Edmund Rice Schools around the world. You can also click here to learn more about the Edmund Rice schools in North America. The Edmund Rice Outreach program serves as students’ outlet into the local community. Every Friday groups of students serve hot meals at the St. Pius soup kitchen. Helping others happens in the community, but it can also happen at school. In the Peer Ministry program, student leaders work together to plan activities like school masses, prayer services and grade school retreats. 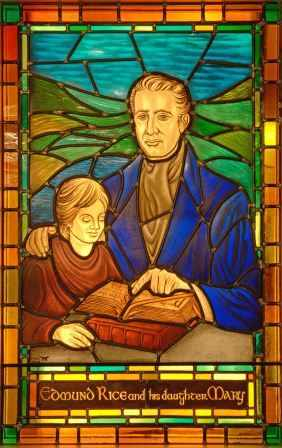 Click here to learn more about the history of Edmund Rice. Christian Service Projects, such as clothing drives and volunteer work at area senior citizen homes, allow students to share their blessings with others in need. Respect and mentoring are key elements found in the St. Laurence Peer Mediation program. When classmates are in need of a helping hand, they can count on their peers to offer advice and guidance in a respectful and peaceful manner. Retreats, like the three-day KAIROS camp, give juniors and seniors at St. Laurence the chance to look within. Taking the occasional off-campus break from schoolwork allows students to focus on their family, their friends and their faith. Click here for details on how to sign up for Kairos 71.